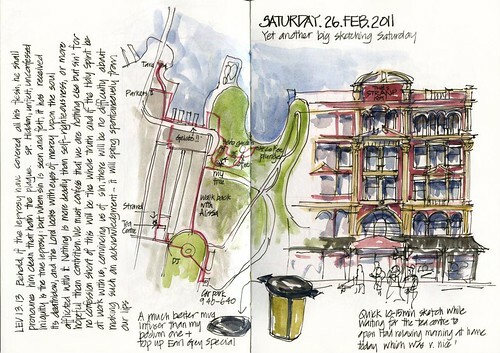 Here are my sketches from Saturday – another big day of sketching! 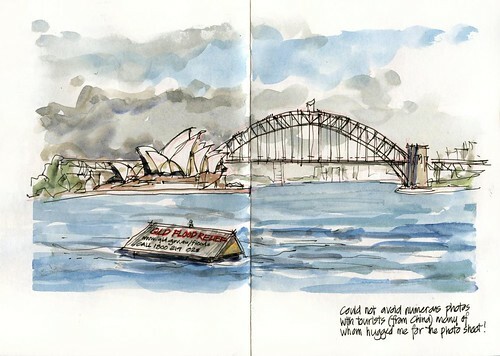 Morning wandering around town, a spot of architecture sketching, a tearoom and an art store visit before heading to the Botanic Gardens...only two weeks to go to the start of the Great Garden Sketchabout..so trying to get some more sketches in my Garden sketchbook. 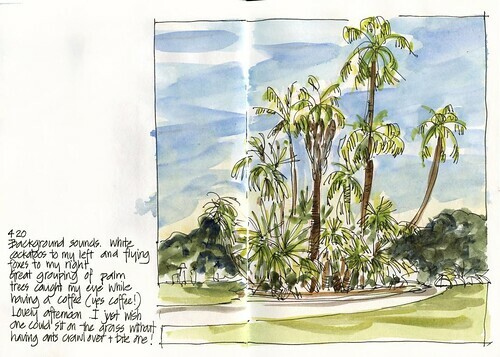 From Saturday 12 March - 18 April, the Royal Botanic Garden Sydney will host a free afternoon Sketchabout. 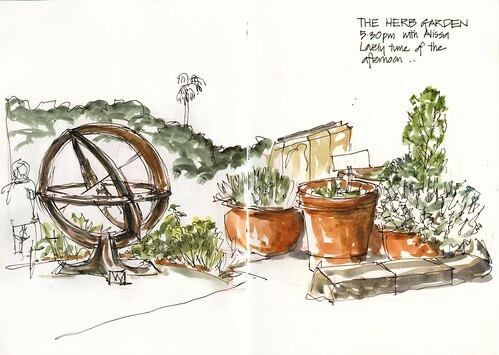 You can meet other sketch artists and chat to our Volunteer Guides about the sights in the Garden. The Restaurant will be offering a special lunch and an afternoon tea with a creation by Chef Hamish Watts that's good enough to sketch (bookings essential). For more information visit www.autumnofthearts.com.au Please also check out the BLOG! I then walked down to the Rocks (actually I should say UP to the Rocks as it is north of the retail precinct) for my second visit to Tara Tearoom. I have to say that I LOVE this place... so excited to find another special tearoom that I can presumptuously start to call 'my (kind-of) tearoom'. 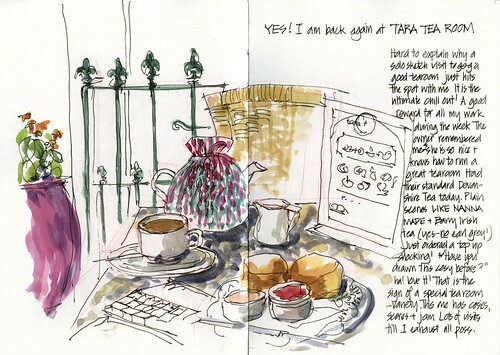 Lots of different tea cosies to sketch on future visits. Next stop was a great art store that actually stocks Daniel Smith!!! Wow! Ok... time for the gardens. First stop was my favourite tree. 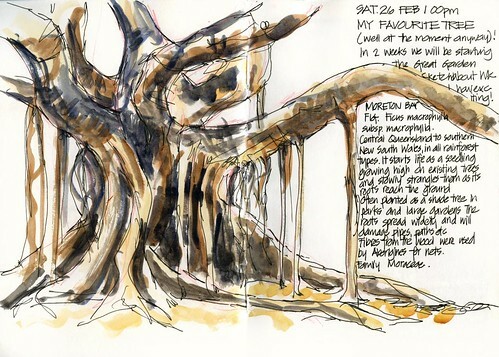 There are lots of Moreton Bay figs (or similar) in the Royal Botanic Gardens but this one is the best!!! Love all those aerial roots. I was feeling a little exhausted so I went to lie down on the grass in the shade for a bit. 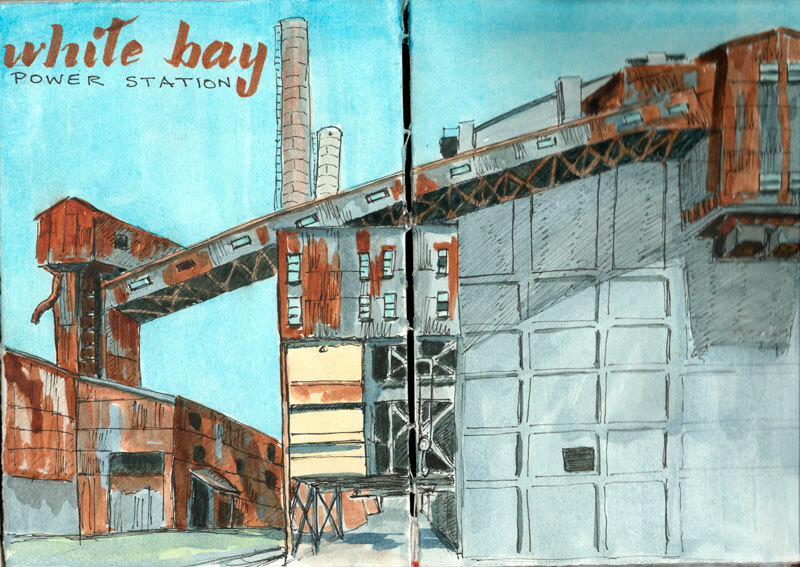 Didn't last long as I felt the urge to sketch. This greek monument I have sketched before and was recently label a coffee plunger here. 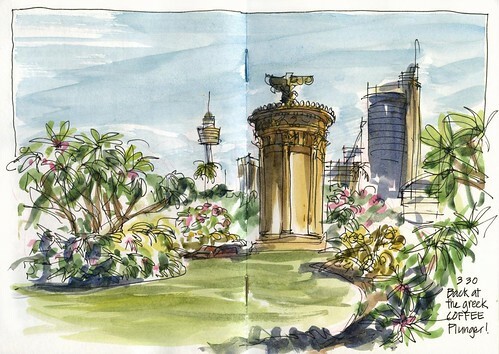 I have always drawn this looking towards the Harbour Bridge but today sitting under the shade of a frangipani tree on a very warm summers day I was facing the opposite direction.